TRIAD 8.5 has just been released and is the latest version of FICO’s combined account manager and customer manager platform for financial services companies (its focus is on accounts/customers where credit risk is a critical issue). I got an update recently focused on Decision Graph. 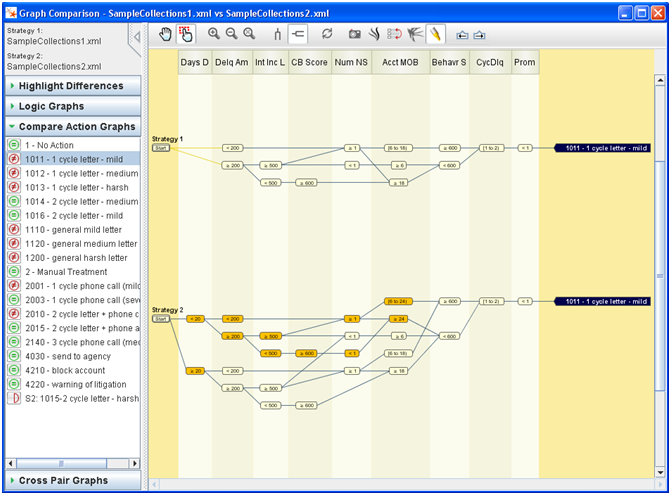 Decision Graph is one of the new capabilities. 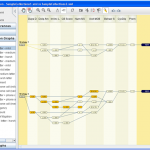 Decision Graph is a new strategy management and visualization tool – replacing or enhancing a decision-tree centric approach. Users can visualize a strategy as a Directed Acyclical Graph (de-duplicates sub-trees that are exact) to simplify the strategy and more clearly see exactly how many distinct kinds of outcomes there are. Users can visualize it as an Exception-Directed Acycical Graph (EDAG) that takes the most complex logic and makes that the exception path – eliminating complexity by emphasizing the simpler paths. A strategy can be viewed through its component action graphs that allow you to focus on the logic that lead to a particular action – each one only focuses on the logic for a specific action. When a typical decision tree for credit management might have 1000s of nodes and actions being able to see the sequence of decision points building up to a specific action makes it much easier to manage the complexity. Strategy slicing (specifying that they want to see only the logic for a particular segment/set of conditions) is key to explicability and compliance. This allows a user to focus, for instance, on how sub-prime customers with a particular range of credit scores are being treated. Analysis of the outcome distribution for a node is also interesting – users can click on a node and see how the population who reach that node will break down across the various actions. Users can see how data “flows” through the strategy. One of the best features is the ability to compare two strategies based on the actual logic not the structure. Comparisons show what is the same and what’s different between two strategies (see figure). Unlike decision tree comparisons, the way the strategy has been documented does not affect the comparison. This allows Champion/Challenger comparisons, different divisions or channels’ approach to customer treatment and much more to be compared. A key use case for this is in mergers and acquisitions where knowing the differences between customer treatment between the two companies is critical. Users can also use this for comparing treatments across product types, or for showing regulators exactly how a given strategy meets compliance requirements. The reduction in complexity is the most critical outcome of this collection of features. They improve the ability of the software to spot errors automatically and any of the visualizations can be used to build and edit a strategy (all share an underlying model). Levels can also be reordered automatically to simplify the strategy (improving execution and understandability), without changing the underlying logic of the strategy. Many financial services companies have found that their strategies have become so unwieldy that editing them is too hard. Using this new feature to reorder and revisualize strategies can result in dramatic reductions in complexity of up to 80% (though 25% is more typical – still very useful). The key advantages for customers are that it allows for more rapid change (improving agility), increased likelihood of finding improvements, lower errors due to reduced complexity and easier explanations/execution. FICO estimates this could be worth $1M per year on a 2M account portfolio. You can see a FICO Tech Talk on TRIAD 8.5 and Decision Graph on YouTube.